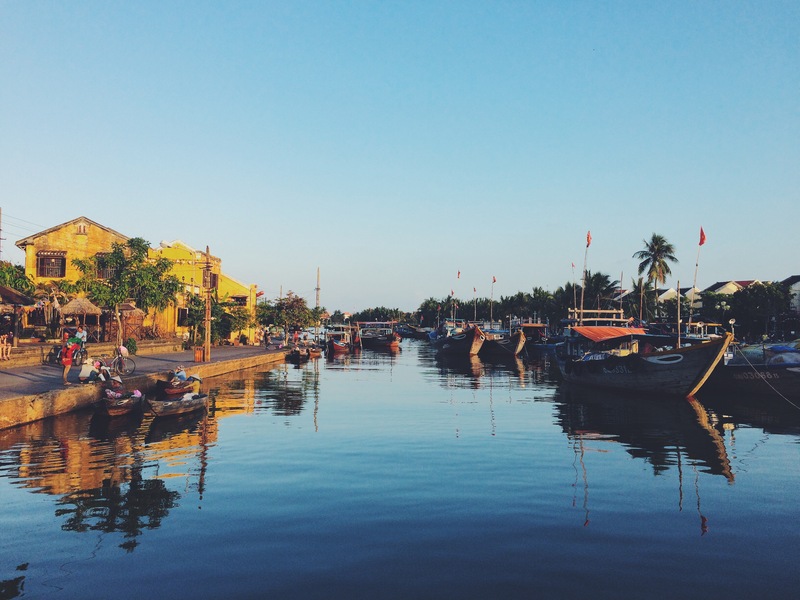 Hoi An is a beautiful Ancient Town nestled on both a river and the Pacific Ocean. While it may be packed with tourists, it’s with good reason. 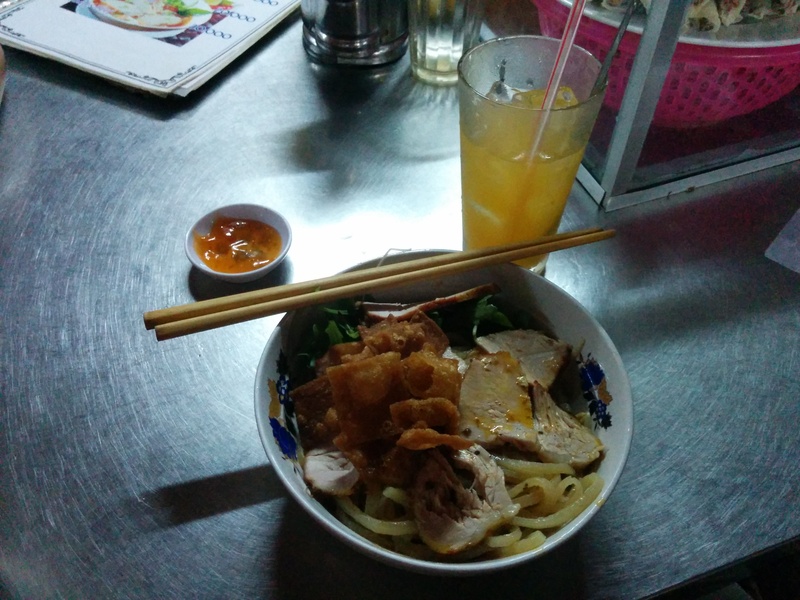 Hoi An has a lot to offer. While our original plan was to head to Hoi An to get a suit made for Luke, we ended up staying in Hoi An for an entire week enjoying beaches, incredible food, and the friendly locals. Being recognized as a World Heritage Site by UNESCO, the beauty of the town is tough to describe in words. 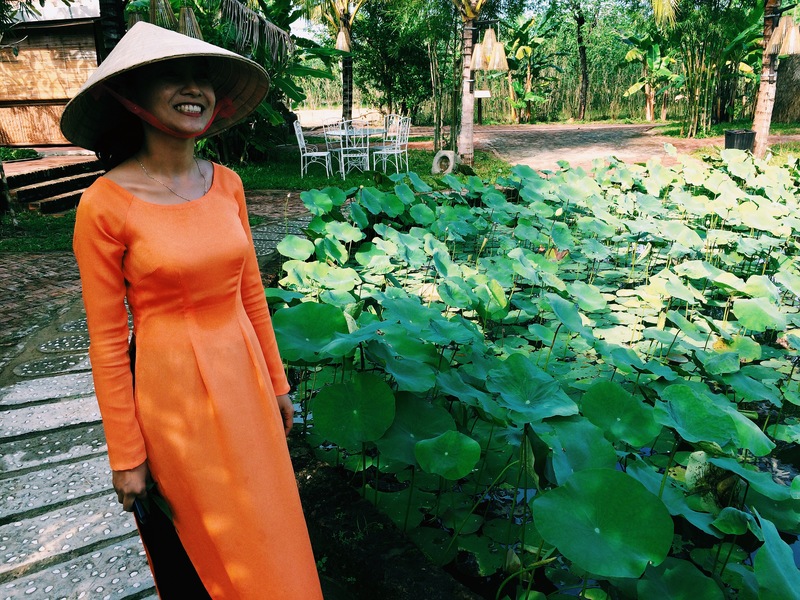 We stayed at the Han Thuyen Homestay in Hoi An and we loved the family feel of the place. A little toddler was running around during breakfast and always there to greet you with a huge smile when you came home. The homestay also offered free bikes to ride in town and really, it’s all we needed. We spent the entire week biking to and from wherever we wanted to go. After getting Luke all dolled up in his handsome suit, we needed some shoes to go with it. We headed over to The Friendly Shoe for some custom made leather dress shoes for him and a pair of leather boots copied off of some I wore out back home in Toronto. For $60 a pair, our feet were measured and we picked out the colours and leather we liked. In just three fittings, they were perfect! Cua Dai beach was a quick 10 minute bike ride along the river ’til you hit the white sand beaches and the kiss of the Pacific Ocean. Almost as warm as bath water, it was still refreshing to bob in the ocean before lounging on one of the many beach chairs local restaurants have set up. It was a great way to get a tan, relax, and spend some much needed time off from the always-on-the-go travelling we had been doing. Every night when it gets dark, Hoi An has lanterns you can light and drop into the river. We were there on the full moon, however, so the city was extra special. 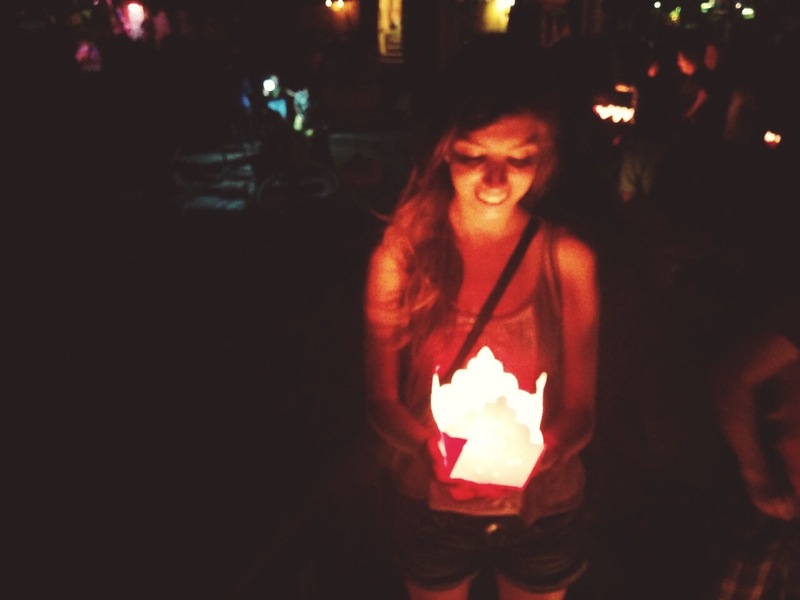 They turn out all of the power and lights near the river, relying solely on lantern lighting. The Japanese Covered Bridge glows, as does the river and all of the boats. For $1 USD, you get two to let into the river for good luck. We absolutely loved spending time by the river in Hoi An. 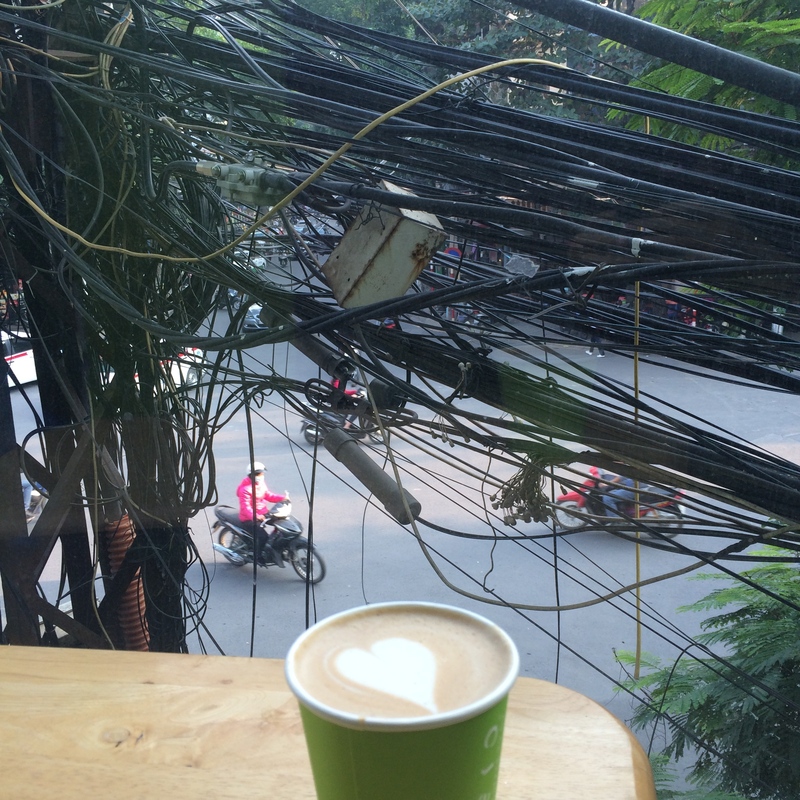 Enjoying a coffee, browsing the many shops, and people watching was the perfect way to spend a vacation. You can fly right into Da Nang for $30 USD from Hanoi, making Hoi An an up and coming holiday destination and we’d highly recommend it. Hoi An is known for its quality silk, so it only seemed fitting to visit the Hoi An Silk Village. It ended up being surprisingly interesting and fun. 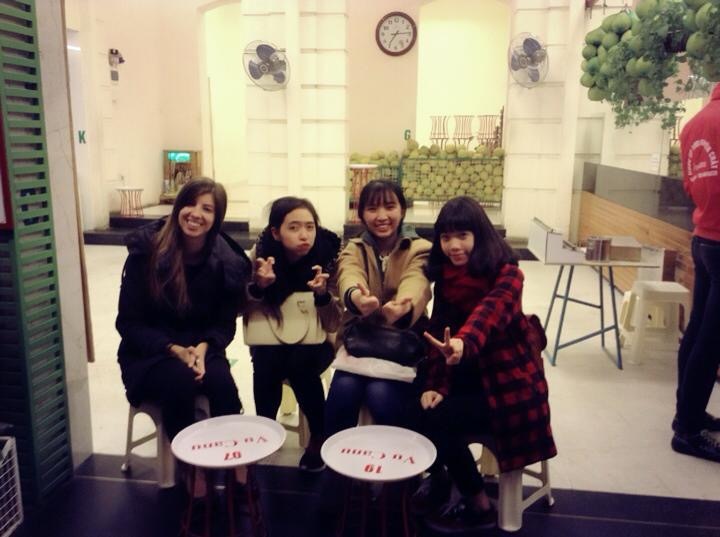 At only $8 USD a person, we were greeted by the sweetest guide with a mulberry drink. Then, she showed a sampling of the more than 100 traditional silk costumes worn by Vietnamese tribes. Following that, she showed us the mulberry gardens while talking about the history of silk. You could hear the silkworms chewing! We got to see the full silk worm life cycle, which is actually only about a month long. 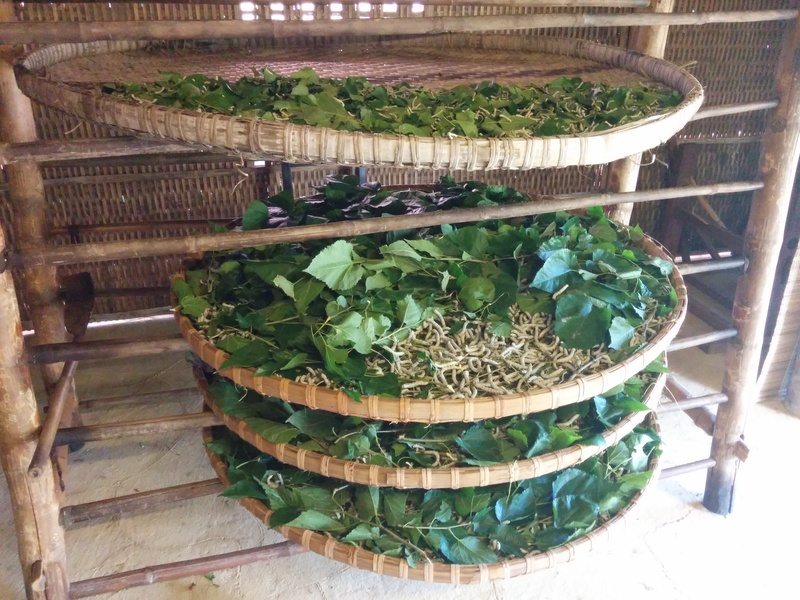 We saw big and small silkworms munching on cut mulberry leaves and also big trays of silk cocoons. Then, we went into the hut where the cocoons are boiled in hot water to dissolve the silk glue so that the women could pull it apart and wind it on a spindle. Luke and Bryan actually ate the the silkworm that had been boiled out of the cocoon. Very gross, but they claim it tasted pretty good. Next we got to watch silk scarfs being made in the traditional Champa weaving style. The process looked extremely tedious with the result being a stunning robe, scarf, or bag. Ending the tour, our guide showed us one final and useful fact. Have you ever wondered how to tell whether your silk souvenir is actually 100% silk? The answer is to light it on fire. Take a small flyaway thread, light it, and smell. Silk smells like burnt hair, and goes out the instant you take the flame away. Cotton and polyester keep burning after you remove the flame, and lack the signature scent. Polyester smells notably of plastic. We tried testing it in the market afterwards – as our guide told us, vendors did not mind a thread being tested to verify the material. All in all, Hoi An is a perfect place for shopping, good food, getting a serious tan, and enjoying the local feel of Vietnam. 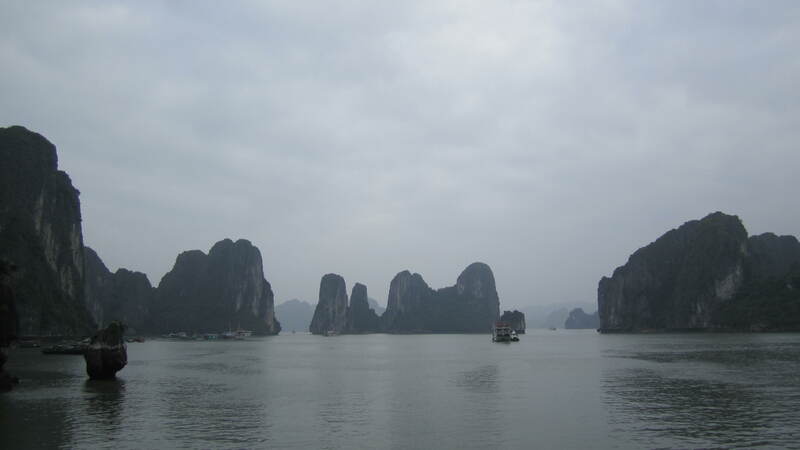 A short plane trip or cheap overnight train ride from Hanoi, we have plans to get back as soon as we can. 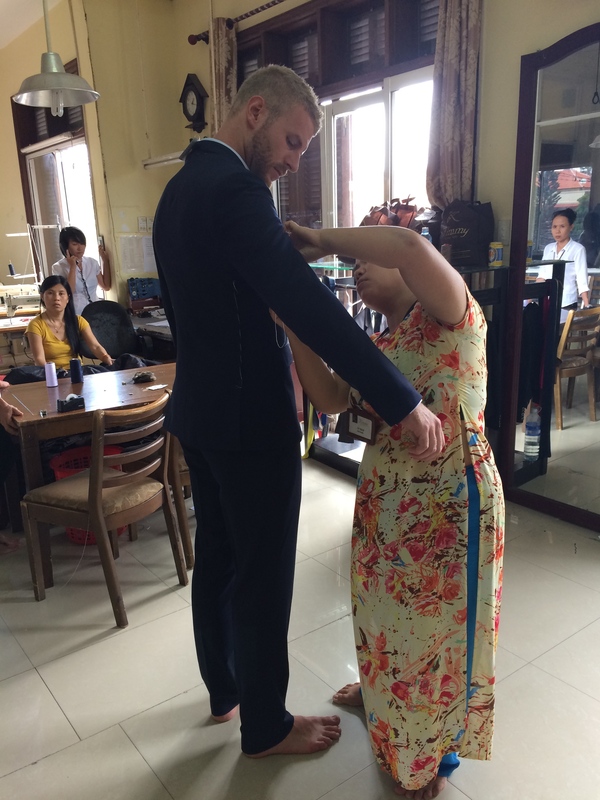 Like many others before us, we traveled to Hoi An anticipating getting a suit custom made and tailored for a good price. We had planned this stop about a year ago when we were brainstorming Vietnam and let’s just say Luke was very excited. Years ago, Hoi An only had a few tailor shops. Now, it has hundreds (depending on your source, it’s around the 600 mark). Walking through the streets of Hoi An, you see shop after shop making suits, dresses, leather bags, leather shoes, and everything in between. The city is a top tourist destination and it really shows. It’s almost a overwhelming how much this city thrives off of Westerners coming to get something hand made. The tailor market has become so popular that some shops are very aggressive when trying to get your business. More on that later. The interior of Luke’s suit jacket. Finding a tailor was daunting, but after a friend’s recommendation and checking some things out online, Luke felt comfortable choosing Kimmy’s. Walking into the bustling shop full of other Westerners, the ladies at Kimmy’s know how to cater to a dude getting a suit. Jumping all over Luke the moment he walked in, they explained the materials, colours, silks, and designs. Nicer fabrics cost more but overall, a three piece suit starts as low as $79 USD or as much as $250 USD. A nice dress was about $50 USD, depending on the length, fabric, etc. This price range wasn’t the absolute cheapest in Hoi An, as some shops offered suits in the $50-150 range, but the quality had been attested for by others. The women walked us through the ‘extra touches’ that they add to their clothes, such as double-stitching key areas, reinforcing stretch points, and using high-quality ‘guts’ for the suit, and we felt good about the slightly higher price point. As I mentioned, the tailor market is extremely cut throat since it’s Hoi An’s bread and butter. While being able to get a cheap quality suit tailor made is exciting, there’s unfortunately quite a dark side to it as well. While we were finalizing some details about Luke’s suit, we heard a smash outside. As Luke looked outside and the women rushed to the window, he could see a terra cotta pot had been thrown at the store front containing grey sludge and dead birds. It was a homemade stink bomb. Quickly, the putrid smell filled the shop leaving everyone gasping and flooding out. It left us pretty shook up. This wasn’t an isolated incident, either. Our tailor told us that this stuff happens from time to time and they have no idea who does it or why. Likely, it’s because someone was jealous of their success and wants to hurt their business. Either way, the stinkbomb was both scary and disgusting. The next day, we went back for Luke’s first fitting. He had settled on a two piece Navy suit with three dress shirts. At the first fitting, everything was almost pretty much perfect. His tailor was great and took all of our suggestions with an encouraging nod. The next afternoon, the suit was complete. All in all, the total cost to Luke for a two piece suit, two ties, and three custom made dress shirts: $220 USD. My experience at Kimmy’s wasn’t as great. I wanted to join in on the experience and get two simple but dressy sleeveless shirts made. Since it was a low commission, my tailor couldn’t seem to care less about really taking care of it. Long story short, after a few disastrous fittings, we decided I should try somewhere else. Thanks to our Irish friends’ recommendation, I headed over to BiBi Silk and the ladies there were so friendly and nice. In just three visits, the shirts were perfect without a hitch! We decided Luke will get his next suit made there on our way back through before leaving the country. Overall, definitely try getting something custom made in Hoi An. 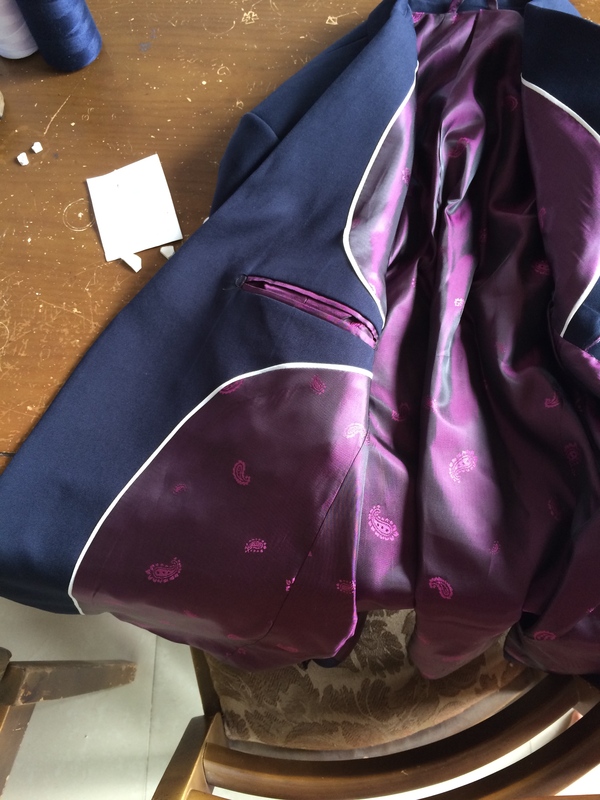 The prices absolutely cannot be beat and if you find a good tailor, you’ll end up with a stunning product. Luke’s been practising his amateur photography skills and he was particularly proud of this picture, so it only felt fitting to showcase it here. 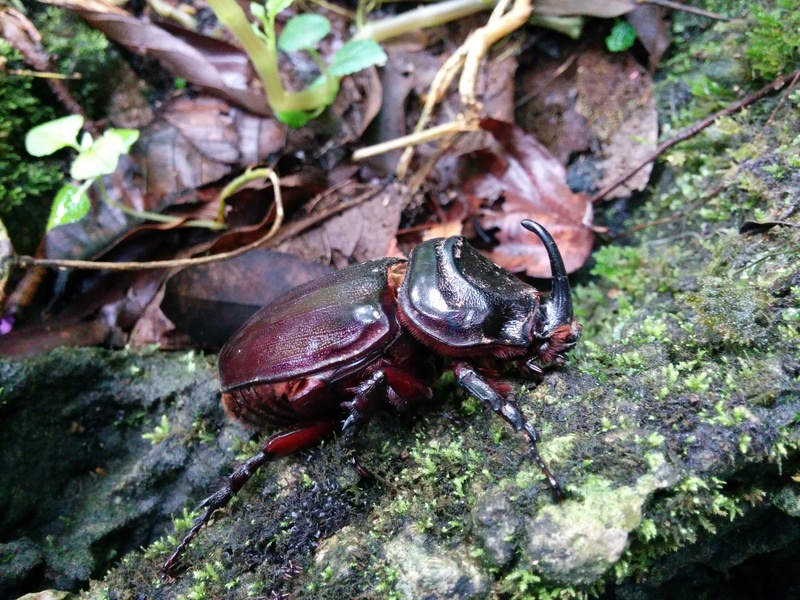 We caught this guy in Vietnam on our way to Paradise Cave. 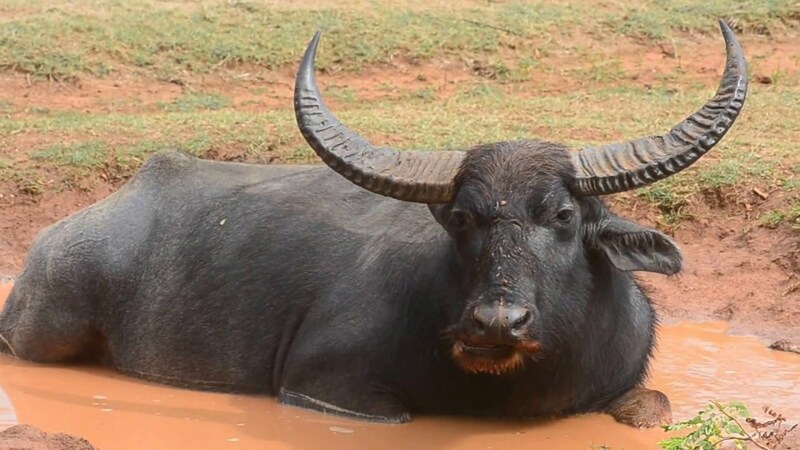 On Day four of the Buffalo Run, it was time for us to do some serious reflection on the Vietnam War (or the American War, as it’s named here). We arrived at Vinh Moc, a deep tunnel complex in the Demilitarized Zone (DMZ). The tunnels were dug right at the edge of the Pacific Ocean and the waves crashing onto the shore created an eery feel. Looking around, it was surprisingly easy to imagine thousands of bombs being dropped as families hid inside the tunnel system during the war. There were still craters left in the ground and black on mountain sides to remind you where the missiles and bombs had hit. The cramped, damp, dark tunnels were home to over 600 people, and 17 babies were welcomed into the world down there between 1965 and 1972. Barely able to stand up inside, families lived in cramped alcoves that left you wondering how they could even lie down to sleep. When the Americans found out about the tunnels, they created bombs designed to penetrate deeper. The Vietnamese’ response was to simply tunnel deeper. At its deepest point, the colony was living about 30 meters below the surface. Talk about resilience. After lunch, we visited the Mine Action Visitors Centre in Dong Ha, which housed Project RENEW. This was a nonprofit organization dedicated to clearing up explosives from the American War days that still remain scattered around the countryside. During the war, the US barraged Vietnam with an estimated 15 million pounds of explosives, and roughly 10% of it never exploded. That 1.5 million pounds has been killing farmers, livestock and children ever since. We were able to join them on a bomb disposal run, as there had been a report of explosives found in a farmer’s field the night before. 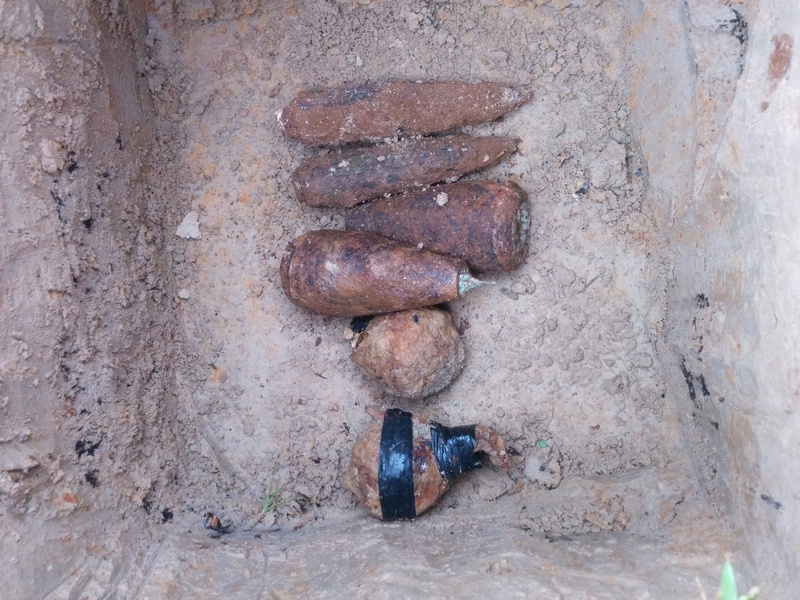 When we arrived, the team had unearthed two M33 grenades, two 61mm mortar shells, and two 37mm anti-air projectiles. All of this had been lying in the farmer’s field since the war, buried deep in the mud. Cows roamed all around, farmers were working, and children were in the schoolyard next door laughing. It was an unsettling sight to see. The reason these bombs didn’t go off forty years ago is not that they were duds. Rather, their trigger mechanisms didn’t activate properly. Bombs that needed to spin a certain amount of times before detonating landed several spins shy. When a child finds it and tosses it to a friend, they can end up dead. Or a bomb that needed impact to detonate might be waiting for a farmer’s plow. We arrived in the lovely town of Hue (pronounced hway) with storm clouds that really didn’t want to let up. Luckily, we stayed at Hue Backpackers. 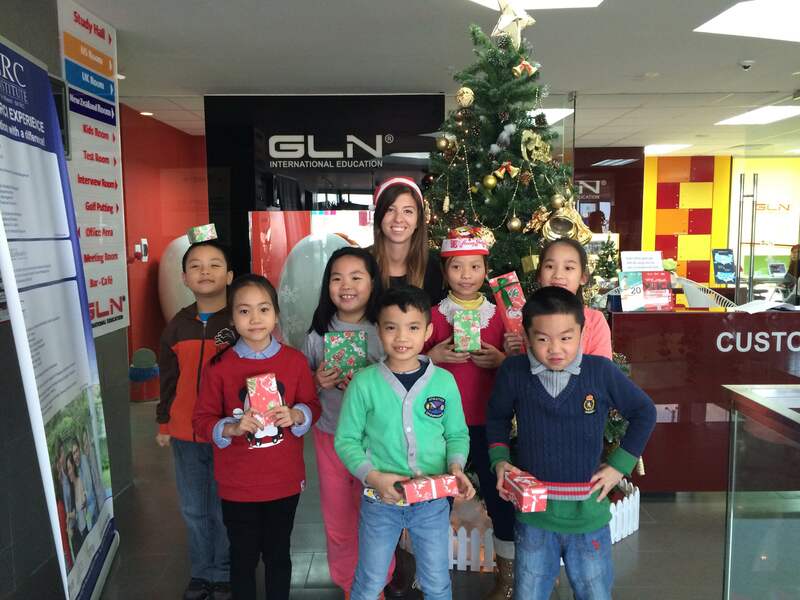 It was a busy party hostel with lots of things to do. We got to fight off the rain with a trivia night and a two-for-one pizza special. Ourselves and our Scottish friends (with a little bit of cheater’s luck) won trivia night! Woohoo. 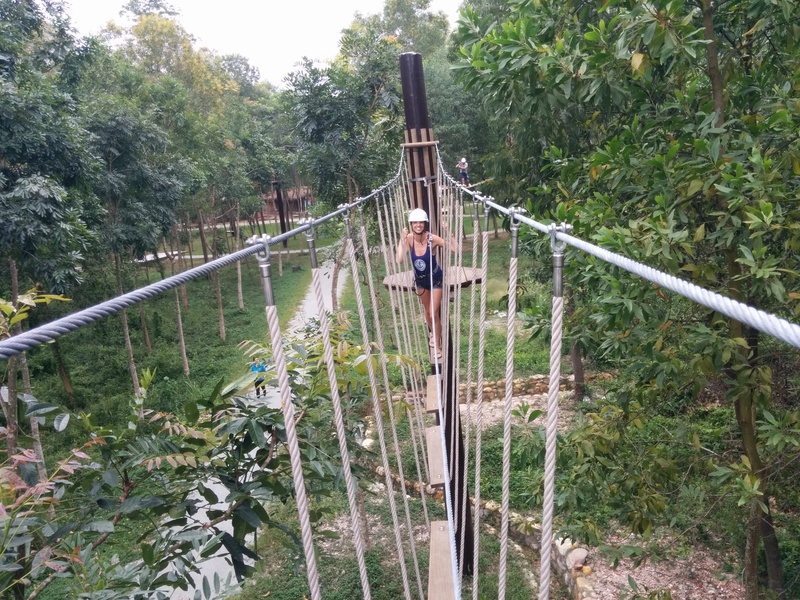 Since it was still cloudy and rainy long after arrival, we changed plans from the original beach activity to zip-lining and the natural hot springs at Alba Thanh Tan. While the zip-lining was a tad anti-climactic (but, still fun) and the rope course was geared more towards teenagers, the hot springs were perfect. We floated around all day, even in the rain, in pools up to 45 degrees Celsius. They had built a lazy river leading away from the source, and each segment was progressively cooler. It was the moment Luke had most been waiting for: the Top Gear motorbike journey through the Hoi Van Pass from Hue to Hoi An. If you haven’t seen the episode, you should! 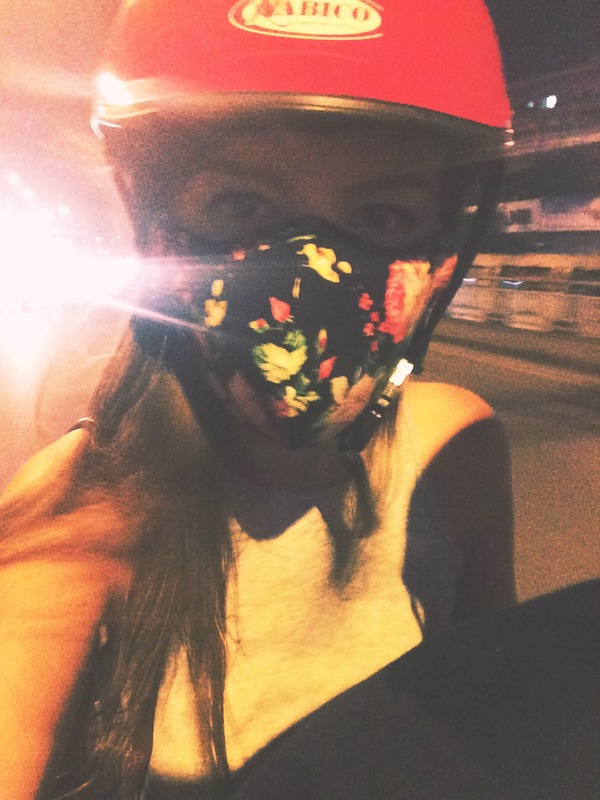 It perfectly describes our new life here in Vietnam and shows the beautiful scenery and crazy roads we travelled. We biked through fishing villages, mountains, farmland, cityscape, and beaches; the journey was much more than we expected. Children waved at us as we drove by and dogs moved out of our way. 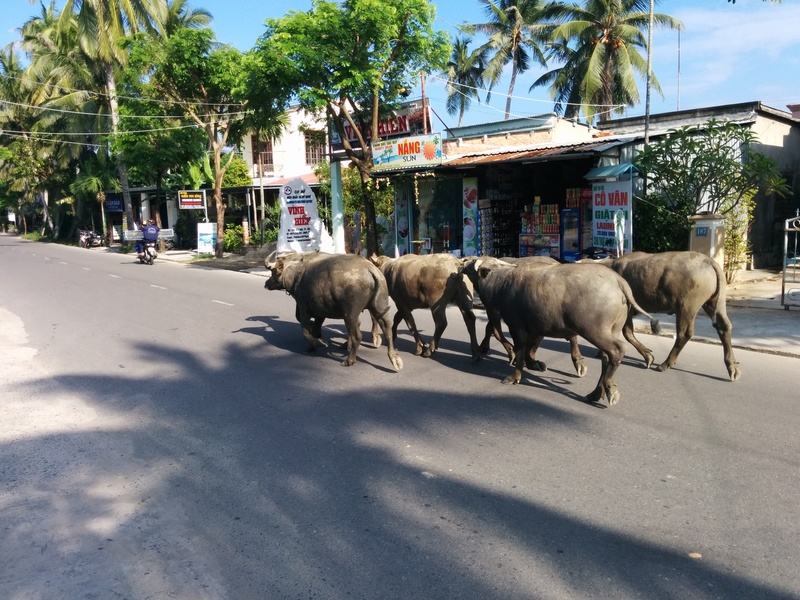 We even had to swerve around massive water buffalo that wandered across the middle of the road! They’re beautiful creatures, to say the least. And in spite of their size, they seem quite unthreatening to be around. Overall, the bike trip took us about six hours. It started with a cruise down to Cua Tu Hien first thing in the morning, followed by the Phuoc Tuong Pass for 20km before hitting the Phu Gia Pass. Then, after driving through Lang Co we stopped for some lunch (if all the names are confusing, don’t worry – we didn’t get it either… we just followed our tour guide down the coast). Our tour guide had heard tell of a waterfall/swimming spot that the locals went to, so he asked our waiter. house with an old lady who waved us in. We stepped out onto a stunning series of waterfalls that originated from way, way upin the mountains. The water was crystal clear and crisp, and the views incredible. It’s gems like these that make hiring a tour guide worth every penny! The group swam and explored for an hour or so before it was time to hit the road again. Getting to the Hai Van Pass was simply icing on the cake at this point. The views just kept getting better. Swerving back and forth across the mountain roads, you could look down and see beaches and a skyline the seemed endless. We pretty much had the road to ourselves as well, so we could take all the time we needed before finally cruising into Da Nang. Finally, with sore bums and a slight sunburn, we reached DK’s House in Hoi An and settled in for some BBQ burgers. Saying goodbye to our tour guide, we were happy to have made some new friends and see some things we definitely wouldn’t have been able to on our own. P.S – Photos from the trip can be all be seen right here. 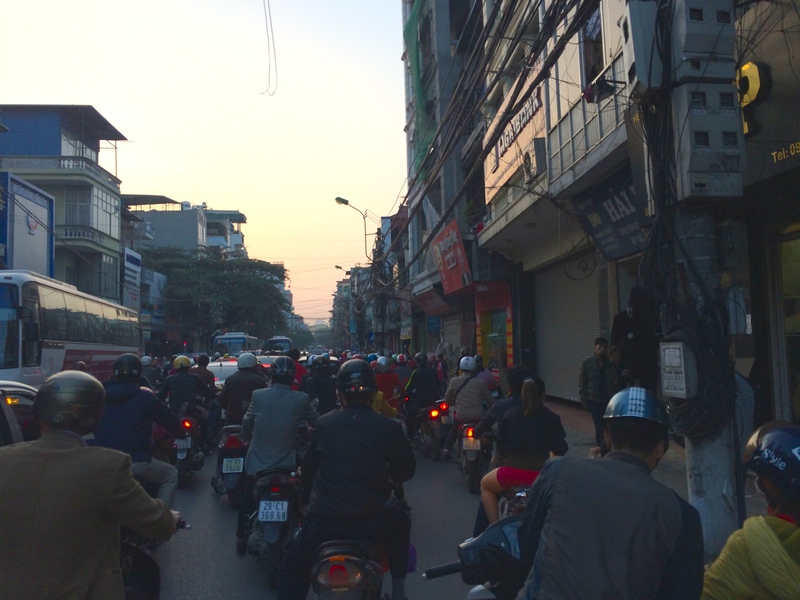 We stumbled upon a group tour called The Buffalo Run, a 7 day haul from Hanoi to Hoi An, and decided it would be a good idea to let someone else do the planning for a change. We did a TON over the 7 days, so we’re going to have to split this post up into two episodes! 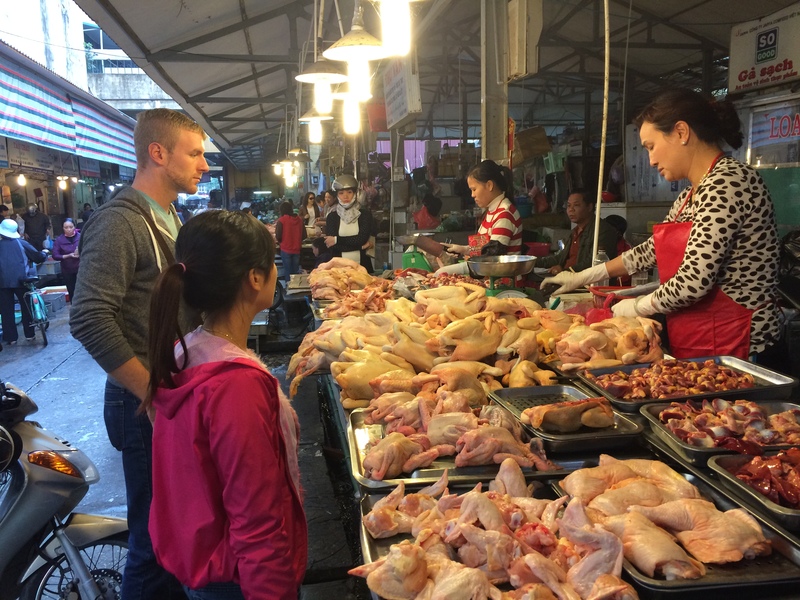 Oh, and we also uploaded a whole bunch of pictures from Vietnam to our Flickr, so you can check them out here. 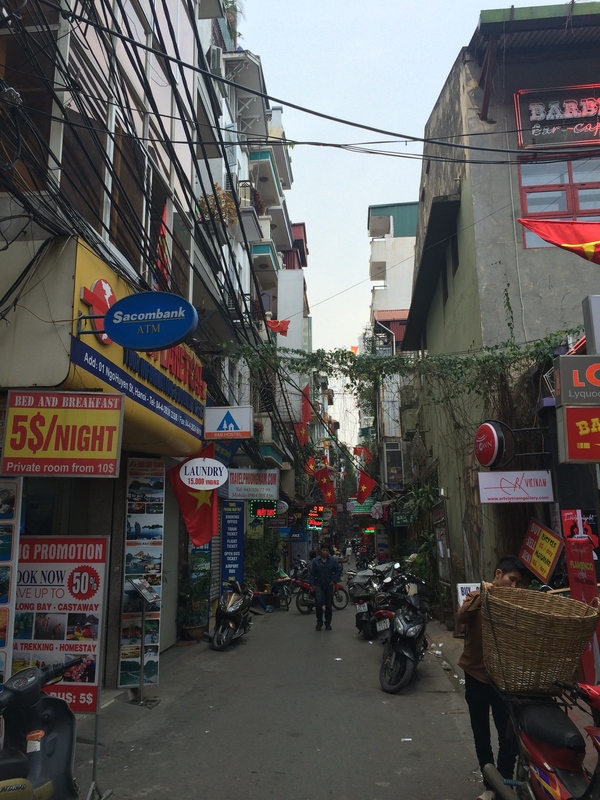 We got up a bit too early and headed to Hanoi Backpackers Hostel for pickup at 6 AM, excited to meet the other people on our tour. We were greeted by Tom, our tour guide, another Tom from the UK, and a Scottish couple, Ryan and Amanda, before hopping into the van. 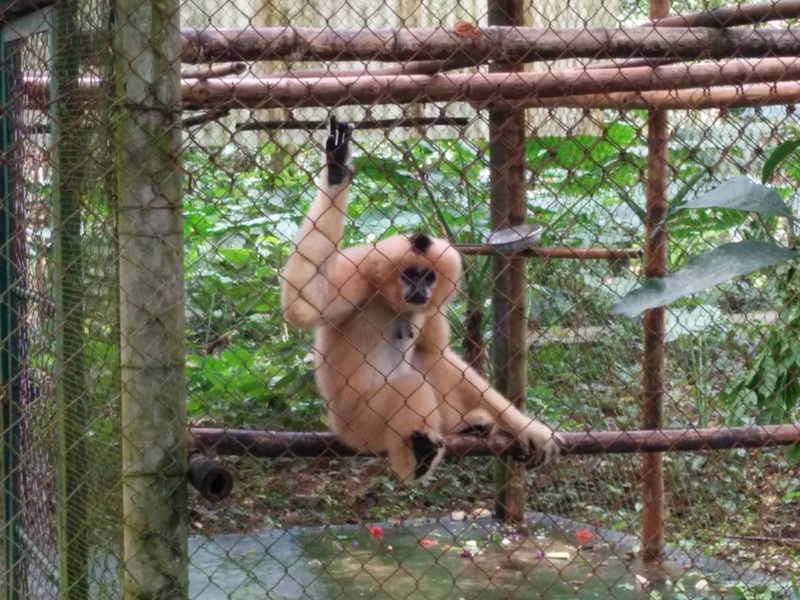 The first stop was Cuc Phuong National Park, where we got to see a bunch of endangered monkeys at the Endangered Primate Rescue Centre, and turtles at the Turtle Conservation Program. It was feeding time at the centre, so the primates were flying around their cages, stoked on life. Little baby gibbons played with their families and the langurs groomed their friends. The centre has over 150 primates, which they breed and try to reintegrate into the wild. For some critically endangered species, they don’t reintegrate them as their numbers are so drastically low. Of the critically endangered species, they have the grey-shanked douc langur, Delacour’s langur, Cat Ba langur, as well as the “Endangered” Hatinh langur, black langur and Laos langur. It was really sad to see some beautiful species which were so close to extinction. After we had lunch we biked an extremely hot 20km, stopping to see the cave of the prehistoric man. This guy’s remains were found and his bones are dated at roughly 7,000+ years old. Truth be told, the cave he was settled in would have made an incredible home. In Cuc Phyong, there were bugs everywhere – in our room, on the paths, at the dinner area, and in the bathrooms. I suppose it was to be expected, since we were in the middle of the jungle, but it’s definitely not ideal for a person who hates being outdoors. Luke got two nice big kisses from leeches on his foot, leaving quite the murder scene in our room. We made the best of this wilderness insanity, however, by doing a midnight safari into the jungle. With our flashlights and headlamps, we tried to see how much disgusting insect and animal life we could stumble upon. Due to the season, it was mainly stick bugs, massive spiders and assorted oversized crawlers. Up nice and early, we started with breakfast and a trek around the park to see the 1,000 year old tree. It’s important to note that it’s been the 1,000 year old tree for years, so we’re not sure how accurate its name is anymore. The tree was somewhat anticlimactic, but the scenery leading up to it was well worth the hike. 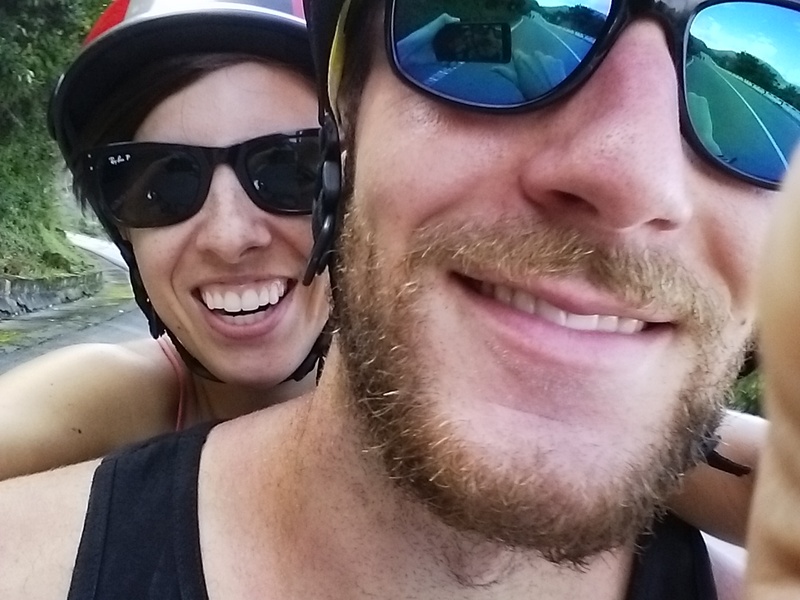 Once we were dripping in sweat once again, we hopped back into the van to head to Trang An in Ninh Binh. Here, we took a beautiful row boat up a clear river, through caves and between mountains (see top photo). A journey lasting almost three hours, this one local woman rowed the entire time, sometimes switching things up by rowing with her feet! Quite impressive. Navigating through dark caves where we had to bend right down to get through, it was a really gorgeous (and sometimes scary!) boat ride. Some of the best views on this tour were, not surprisingly, adorned with picturesque temples. All in all, it made for a very relaxing and beautiful journey with tons of photo ops. Not long after that, we were off again for a 10 hour overnight bus to Phong Nha National Park. I wasn’t mentally prepared for such a long bus journey, but it was fairly manageable. You get seats that recline almost entirely down, with places for your feet, plus pillows and blankets. Luke, unfortunately being 6’3″ and size 14 feet, couldn’t really fit… but of course, he still slept like a baby. Up nice and early once again, we were off to Paradise Cave. The cave is 31 km long and can reach up to 100m high and 150 wide at some points. While we were only allowed to enter one of the chambers (not the record setting areas), what we got to see was breathtaking. In Luke’s words, it seemed like we were in the dwarven cities you see in Lord of the Rings. Standing inside something so big, damp, and cold was surreal. The colourful rock formations grew up from the floor like creepy alien spires. We took pictures, but they didn’t do justice to what we saw. After that, we went for another lunch by a clear, fresh river, which rumour has it originates all the way from Laos. Probably the coldest water we’ve felt, but it was a perfect aqua blue and a nice refresher on a hot day.